For the Sonic Runners version of this stage, see Windy Hill (Sonic Runners). Windy Hill (ウィンディヒル Windi Hiru) is the first world of Sonic Lost World. Located on the far-left corner on the Lost Hex, Windy Hill is the location where the events of Sonic Lost World begin, as Sonic the Hedgehog and Miles "Tails" Prower crash-land at Windy Hill after their recent ambush with Dr. Eggman. In the 3DS version, the player can gather Green Material here. 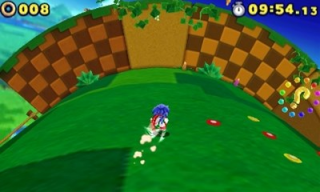 Following immediately after the intro, Zone 1 of Windy Hill kicks off the game with a Green Hill Zone-esque stage mostly played in the 3D "behind-the-back" perspective gameplay that the past Sonic the Hedgehog video games have used over the years since Sonic Adventure. Sonic travels forward across many tubular planetoids full of windmills to ride on, Moto Bugs, Choppers, Snail Blasters and Orbinauts to get in his way, and sheep that do not pose as a threat to him. Along the way, Sonic can use the Cyan Laser Color Power. Zone 2 is a full 2D-perspective zone where the gameplay is slightly like the gameplay from the Sega Genesis Sonic the Hedgehog games. This Zone takes place at sunset, with the sun gradually giving way to night the further the player goes. This stage also introduces the brand-new Indigo Asteroid Color Power halfway through. After passing a giant wall and seeing the night sky, a strange Moon Mech hovers in the sky, with Zazz popping out from behind it to engage Sonic. Zone 3 takes place within a tubular gem mine inside ancient ruins, where the gameplay has been switched to behind-the-back perspective. Rolling, breakable boulders roll inside the tubes which can hurt Sonic if the player is not careful, and green slime can slow Sonic in his tracks. By using the bounce attack in certain places, Sonic can discover secret routes often containing goodies. Cyan Wisps also appear here. Zone 4 has two segments within the zone; the first half of the stage is devoted to a behind-the-back perspective gameplay style, then the other half has the gameplay switch to a 2D side-scrolling perspective like in Act 2. The sheep return, only this time some of them will turn red and try to push Sonic off the stage when he gets near them. In the second half of the stage, Sonic will have to jump across log bridges in waterfalls, avoid flowers that turn into buzzsaws, and use the Indigo Asteroid to clear obstacles and find hidden items. Upon reaching a certain point, Zazz will show up again to chase Sonic before starting a boss fight. 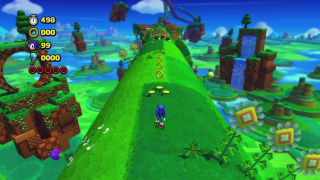 The game begins with a basic tutorial that explains the Parkour system of Sonic Lost World to the player and the control scheme used for the game. Like its Wii U/PC counterpart, Zone 1 of Windy Hill on the Nintendo 3DS version of Sonic Lost World offers a behind-the-back perspective point-of-view level design, with a level appearance much like its Wii U/PC counterpart (with minor exceptions, such as the lack of waterfalls). The biggest change is that a selected path is the only way to go in the Zone, unlike the Wii U/PC version, in which the said version the player can go through multiple pathways. Sonic must avoid Moto Bugs, Buzz Bombers, large Sandworms, and eventually a colossal Caterkiller that chases him. The Indigo Asteroid Color Power is also introduced here. Zone 2 in the 3DS version is similar to Zone 3 from the Wii U/PC version, as it is set in an underground tunnel that defies gravity and is literally a fairly straightforward Zone. Several pools of lava appear here instead of the slime puddles of the Wii U/PC version. The Red Wisp appears here, allowing Sonic to use the Red Burst Color Power, and by dipping into the lava pools while it's active, Sonic can recharge the Red Burst. Zone 3 marks the first 2.5D Zone of the 3DS version, set at sunset like Zone 2 from the Wii U/PC version. The purpose of this level is for the player to familiarize themself with using parkour in a 2.5D space, as the design is primarily an obstacle course full of speed boosters, spikes and Grabbers. At certain intervals in the Zone, Zazz will show up and repeatedly toss his Moon Mech at Sonic, who must dodge the Moon Mech until the pink Zeti gets fed up and leaves. Moto Bug - Drives along long areas of ground in 2D, but completely static in 3D. Usually moves in groups. Appears in all Zones. Chopper - A piranha-looking robot that jumps out of bridges, as in its past appearances. Appears in Zones 1, 2 and 4 . Snail Blaster - A snail-like robot from Sonic the Hedgehog 3's Launch Base Zone. Unlike its past appearance, it does not go up walls, but crawls slowly in the lateral direction of the ground and can shoot two projectiles. Appears in Zones 1 and 2. Orbinaut - The greenish version, Uni-uni, appears here. In 2D sections, it usually slides from one side to the other, usually accompanied by other Orbinauts to form barriers. As the player approaches, it casts its spine balls downwards, leaving it defenseless. In 3D sections, it does not throw his spiked balls down, and is thus defended by its barrier. Appears in all Zones. Batbrain - A bat-like robot that attacks normally in groups in tubular areas. Appears in Zone 3. Caterkiller - A caterpillar-like robot from Sonic the Hedgehog's Marble Zone. Unlike its original version, they are larger in size, but as its original version, its weak point is the head, so using a Homing Attack or a Stomp is essential to destroy it. Appears in Zone 4. Newtron - A chameleon-like robot that materializes in certain areas and shoots projectiles (green version) at the player or falls and runs along the ground (blue version). Appears in Zone 1. Moto Bug - Drives along long areas of ground in 2D, but completely static in 3D. Usually moves in groups. Appears in all Zones (including Tutorial). Buzz Bomber - Flying hornet-bots that buzz through the air, firing shots. Also, they may be in a steady state in 3D parts. Appears in all Zones (including Tutorial). Newtron - A chameleon-like robot that materializes in certain areas and shoots projectiles (green version) at the player or falls and runs along the ground (blue version). Appears in Tutorial Zone and Zones 1 and 2. Spinner - Helicopter-bats which serve as Homing Attack stepping-stones. Appears in all Zones (including Tutorial). Caterkiller - A caterpillar-like robot from Sonic the Hedgehog's Marble Zone. Its body consists of prickly segments that come loose when the player hits it in the wrong place. Its weak point is the head. Appears in Tutorial Zone and Zones 1 and 2. Sandworm - A caterpillar-like robot from Sonic & Knuckles' Sandopolis Zone. They come out of hatches and sometimes hide springs or other objects / items in their bodies. Sometimes they are necessary to progress in an area. Appears in Tutorial Zone and Zones 1 and 2. Batbrain - A bat-like robot that attacks normally in groups in tubular areas. Appears in Zone 2. 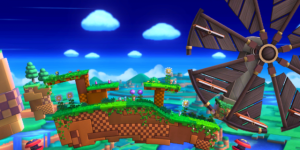 Windy Hill as it appears in Smash Wii U.
Windy Hill also appears as a stage in Super Smash Bros. for Wii U as Sonic's home stage. It is a large platform with three smaller platforms above it, various Animals as spectators, and the giant windmill from Zone 1 on the side. Players can stand on the windmill's platforms, but they must be careful not to stay on them for too long as they will go offscreen beyond the blast lines. Springs appear on both sides of the stage that will allow players to bounce back onto the stage, but they can turn and instead catapult players away. There is also point-like center of gravity similar to the Mario Galaxy stage. Because of the size, gimmicks and gravity effects, this stage is banned from tournaments. Like all stages in the game, Windy Hill has an "Ω Form" where the stage is a single flat platform devoid of gimmicks like the Final Destination stage. Windy Hill was also one of the three standard stages of Sonic Runners, and the first one the player would run through during the story. It was a Speed Type stage, and contained obstacles suitable for Speed Type characters such as Sonic. This stage would also appear in certain event episodes with cosmetic changes, such as party banners for the "Happy Birthday Sonic!" event. This page was last edited on 10 April 2018, at 17:30.